Mizuno unveils its new highly engineered JPX919 series of irons designed to deliver exceptional performance for all types of golf swing. The JPX919 Tour irons are the successors to the very successful JPX 900 irons. The JPX 900 series irons led a resurgence for Mizuno, with the Tour model residing in the bag of the back-to-back 2017/2018 US Open Champion. Now Mizuno has unveiled the next evolution of JPX – the JPX919 Series, a highly engineered family of irons that has evolved alongside Mizuno’s comprehensive custom-fitting program to deliver exceptional performance. Each model in the JPX919 series is engineered from different base materials to help enhance performance for particular swing types. 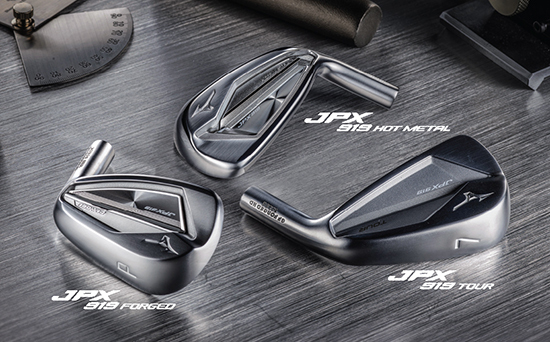 The new family comprises of 3 types of irons, JPX919 Tour, JPX919 Hot Metal and JPX919 Forged. The JPX919 Tour promises tour-caliber performance with precision distance control. 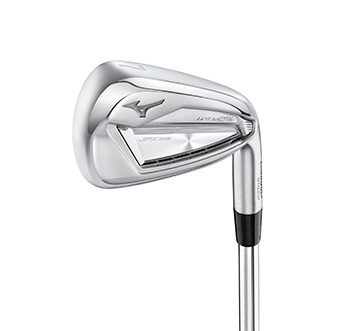 It is a more compact, streamlined evolution of Mizuno’s standout JPX900 Tour iron from 2017/18, which helped to re-establish Mizuno as the iron of choice on tour among both contracted and non-contracted players. 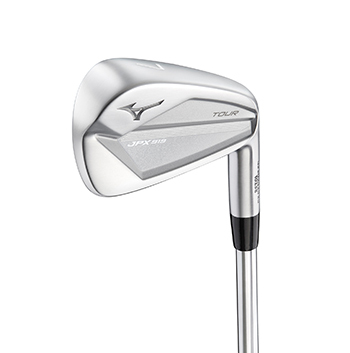 Grain Flow Forged HD (High Density) from a single billet of 1025E Pure Select Mild Carbon Steel in Hiroshima Japan, the JPX919 Tour offers the softest, purest Mizuno feel yet. 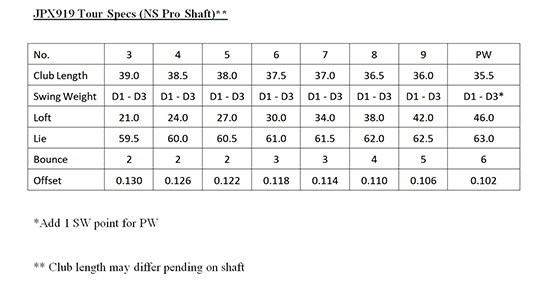 The top edge of JPX919 Tour irons have been narrowed by 10% compared to its predecessor to match the grinds most commonly requested on tour. Despite being more compact, is still offers surprising stability for a compact player’s iron. Its open heel frame enhances stability and launch, delivering tight distance patterns on off-centre strikes, while still producing a tour-preferred vibration and sound at impact. The JPX919 Tour features a Pearl Brush chrome-plated finish to enhance durability and soften its precise lines in bright sunlight and can be built to a customer’s desired specification as part of a full. Split or short set. The JPX919 Tour Irons are available in right-handed only. The JPX919 Hot Metal provides a benchmark in iron design, engineered for the perfect blend of ball speed and soft, controllable landing angles. High-strength Chromoly 4140M has paved the way to a new multi-thickness face that promotes astonishing ball speeds, while a seamless one-piece cup face construction ensures surprising levels of feedback and stability even at such unprecedented ball speeds. The JPX919 Hot Metal offers a steeper transition into more compact scoring irons and wedges, with set-matching gap and sand wedges available engineered from a softer X30 steel. 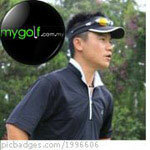 It also boasts precision-milled grooves and faces for improved spin and control around the greens. The JPX919 Hot Metal irons are available in right-handed only. A new reverse-milled clubface, CNC-milled from the sole up to create a larger area of minimum face thickness, makes the streamlined JPX919 Forged Mizuno’s fastest ever forged iron in terms of measured ball speed. The resulting weight removed from the face also allows a lower, deeper centre of gravity, making it easier to flight the long and mid-irons. 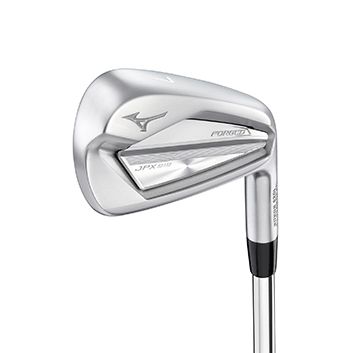 Mizuno’s trademark workability and elevated Gran Flow Forged HD feedback ensure that the JPX919 Forged is also Mizuno’s most versatile iron. Like the JPX919 Tour and JPX919 Hot Metal, the JPX919 Forged features a durable Pearl Brush Finish and a stability frame, open at the heel portion to enhance stability, launch and loft-appropriate flight apex for soft-landing approaches. The Forged model is Gran Flow Forged HD (High Density) from a single billet of 1025B mild carbon steel in Hiroshima Japan for an unmistakable Mizuno feel, with just a trace of Boron infused into the Billet to make it 30% stronger and allow greater design possibilities in a forged head. The overall package is one of “balanced performance” with the JPX919 Forged offering the ultimate blend of ball speed, stability and feedback within a more refined playing profile. The JPX919 Forged irons are available in right-handed only.